Today marks the mid-point of National Nursing Week. This year's theme identified by the Canadian Nurses Association is "The Health of Our Nation". The international theme this year is "Closing the Gap: From Evidence to Action". These themes speak to the heart of our family life and what nursing means to Nicholas' wellbeing. Nick could not survive without nurses. Each evening at 8pm, a nurse arrives in his room. Nick's greatest medical needs are at night - once asleep, he often stops breathing because of central and obstructive apnea. When this happens, an alarm sounds on his oxygen monitor and the nurse will reposition Nick or stimulate his face to restart his respiration. The nurses give medications via Nick's stomach tube, they take care of his incontinence needs, and they keep him comfortable by frequently repositioning him in bed. Nicholas' nurses make careful and copious notes about his hour by hour pain levels as well as his respiration and they monitor his vital signs especially if he is unwell. But this is not all the nurses do. At 8pm, Nicholas is awake and usually watching television. He might be cheering for his team in the Stanley Cup ice hockey finals, or watching re-runs of his Liverpool Football Club in action back in the UK. Ask Jen, Tiffany, Karen, Crystal, Patricia or any of his nurses - they all know team scores, best players and how to trouble-shoot when the technology connecting Nick's computer to his big-screen TV goes on the fritz. Christine is the head nurse at the facility where Nick lives. She is in charge of all things medical for Nick and others who live with Nicholas as well as adults with disabilities residing out in the community with their families. Christine has helped me problem solve complicated medication problems, accessing difficult-to-reach doctors and finding solutions to funding problems for equipment and medical services. Together, Christine and I can get around pretty much any medical problem that life throws Nick's way. Nicholas has had over 65 hospitalizations in his life. We have known many nurses both for home and hospital care in Canada and the UK. Nick is a Canadian and he is healthy - he is a living example of why nurses in our country celebrate "The Health of Our Nation". And he is medically complex - a testament to years of nursing notes (ie. the real story in the day of a patient) being transformed into best practice. Today, I would like to say THANK YOU! to all Nick's nurses, those incredible individuals working now, in the past, in Canada and in the UK. Happy National and International Nursing Week! 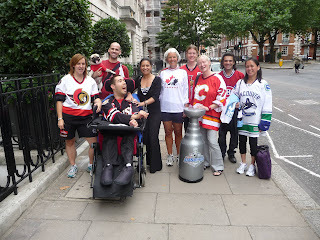 This photo was taken on Nick's birthday (a ball hockey tournament in Hyde Park, London, in 2010). Melinda, Nick's nurse, is on the far right and Angela, another wonderful nurse has her hand on the cup. Thank you Melinda and Angela, we love you! 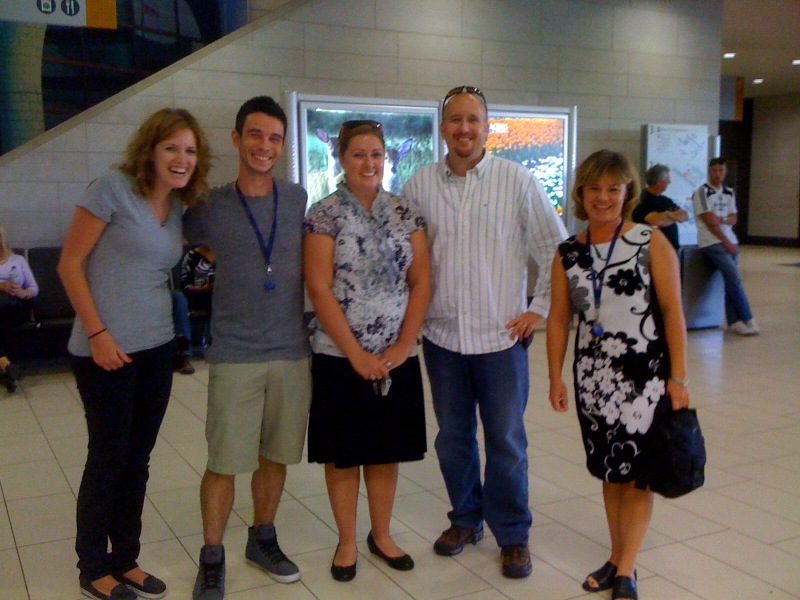 And this photo was snapped at the airport when we arrived in Canada last summer. Christine, our incredible head nurse is on the left. Thank you for everything you do, Christine!